Multiplatform publisher GungHo Online Entertainment America (GOEA), who has been behind previous titles like Puzzle & Dragons, Freak Tower and many others, has announced that their side-scrolling, puzzle-based chalk-art adventure PC game, Dokuro, has made its way to Steam Greenlight today. 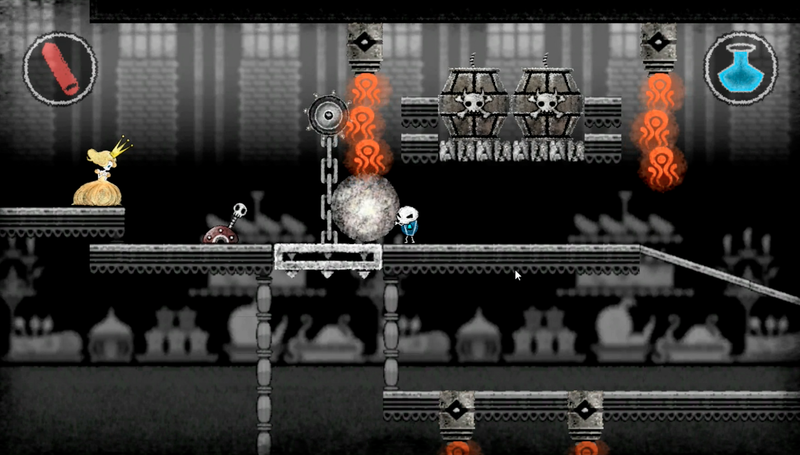 You may have played it before, because it has been made available on the PlayStation Vita, and iOS/Android devices. The PC users in the community will finally get a chance to come to get what they asked for. As mentioned above, in Dokuro, players will get to take contol of a brave little skeleton, who seems to be having the last straw when it comes to his master, the Dark Lord. This brave little skeleton wants to change it up a little, and instead goes and tries to rescue the recently kidnapped princess. Though it isn’t all the easy usually when it comes to rescuing that damsel in distress. The little brave skeleton will need to guide the princess through various dangers and pitfalls of the castle in order to keep her going and of course not being doomed and just fall or hurt herself in the process. You don’t have to play as the brave little skeleton the whole time, you can drink the blue elixir, with this drink Dokuro will be able to turn into a dashing prince and hero. In Dokuro, you will get to experience the following; challenges that will make players use both Dokuro’s skeletal and hero/prince form to approach and take on various puzzles, traps, spiked pits, and boss battles, all while trying to do one main goal, and that is to save the princess. Are you up for the challenge? If interested, you can download the game for your PlayStation Vita, iOS devices via iTunes and Android devices via Google Play. You can find out more information on Dokuro on the official site. Plus keep up-to-date with Dokuro via liking GungHo Online Entertainment America on Facebook and following them on Twitter.